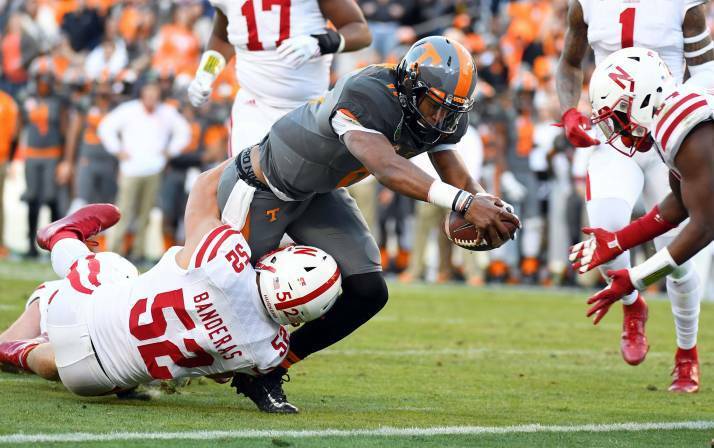 Tennessee quarterback Josh Dobbs reaches to complete a 10-yard TD run in the second quarter. NU: Ozigbo 7-66; Newby 9-15; Carter 1-9; Morgan 1-0; Wilbon 1-minus 1; TEAM 1-minus 1; Fyfe 8-minus 27. UT: Dobbs 11-118; Kelly 15-70; Kamara 7-31; Jennings 2-14; Byrd 1-9; TEAM 1-minus 1; Smith 1-minus 11. 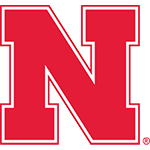 NU: Pierson-El 5-49; Reilly 4-98; Morgan 3-28; Carter 2-34; Reimers 2-26; Newby 2-11; Ozigbo 1-11. UT: Kamara 7-46; Jennings 6-59; Malone 5-120; Croom 2-38; Smith 2-13; Wolf 1-15. Brandon Reilly catches the ball for a third-quarter touchdown over Tennessee defensive back Micah Abernathy. Huskers Fall to Tennessee in Nashville: Nebraska fell behind 14-0 midway through the first half and was unable to recover in a 38-24 loss to Tennessee in the Music City Bowl. Tennessee quarterback Josh Dobbs completed 23 of 38 passes for 291 yards and a touchdown while adding 11 carries for 118 yards and three rushing touchdowns. He finished with 409 total yards. Nebraska’s Ryker Fyfe, who drew the start in place of injured four-year starting QB Tommie Armstrong Jr., answered with 243 yards on 17-of-36 passing. He threw a pair of touchdown passes Brandon Reilly, who finished with four catches for 98 yards. Devine Ozigbo sets up Nebraska’s second TD with a 42-yard run. The Huskers at least came back and made it a game. And for that, you have to give them some credit. The trenches is what stuck out to me. Friday’s Music City Bowl provided another Big Ten West opponent. The Vols did the rest. At some point ... Tennessee has to turn the positive momentum from winning a bowl game into actual on-field results the next season. This may have been one of the worst displays of tackling we’ve seen from Nebraska all season. For too much of this loss ... the Huskers didn’t play with enough tenacity. Tennessee’s defense gave up 420 yards rushing to Missouri in November. ... And the Huskers go for 2.2 yards per rush against these guys? This was the end of year two under Riley, but year three feels like a sort of rebirth.